We all know that wrinkles are a big concern for many of us. However, high up on the list of desired things to combat is pigmentation patches. Pigmentation can be due to multiple causes and can be challenging to treat. It is a condition which causes the skin to look lighter or darker in areas giving uneven skin tone. If you have brown patches it is what’s known as hyperpigmentation. So what causes pigmentation? There are several causes including increased levels of melanin, a result of an injury/inflammation, such as a tattoo, a burn or chemical exposure, sun damage, acne or hormonal changes. Who is at risk? Pigmentation is more common in people who have olive to darker skin. If your mother has them then you are at a higher risk of having them, although it is becoming more common in England due to excess sun exposure. Due to this fact the best thing you can do to help prevent it is to protect your skin from the sun every day with sunscreen. During pregnancy your skin is particularly susceptible to pigmentation due to hormonal changes. This type of pigmentation as known as Melasma. It normally appears on your face. This can also be caused by taking the contraceptive pill. The dark patches often fade post pregnancy or if you come off the pill, but in some cases treatment is needed. Sun spots/ age spots are caused by sun exposure are often wrongly described as liver spots. They can look like large freckles and appear years after sun exposure began. Although people with olive skin are more prone to get sun spots, anyone who exposes themselves to enough sun can get them. Once you have the sun spots it is still important to wear sunscreen as the sun can make them darker. It is important to get your patches checked with a GP as sometimes it can be a result of a disease such as melanoma. Obviously the best therapy is a preventative approach, using a skin cream with vitamin A, such as Environ, which is not only nourishing and restorative, but also protects the skin from sun and environmental elements. The vitamin A in the product will also help the skin to shed pigmented cells. To speed up the process Bodilight offers intensive Environ facials which drives the vitamins A, C, E and beta-catotene into the skin reducing uneven skin tone. You can follow this with the Environ homecare products. Another approach which offers more immediate results are resurfacing procedures, such as chemical peels and microdermabrasion. The skin peels work by using a chemical, such as glycolic acid, which causes the top layers of your skin to shed. Microdermabrasion works by using tiny crystals which exfoliate the skin to take off the dead top layer. Agera RX is a skin peel which is highly effective in gently reducing the appearance of unwanted discolouration by penetrating the skin pigment cells. There is also a range of daily Agera Rx medical formula products which can be used in conjunction with your skin peel for maximum results. 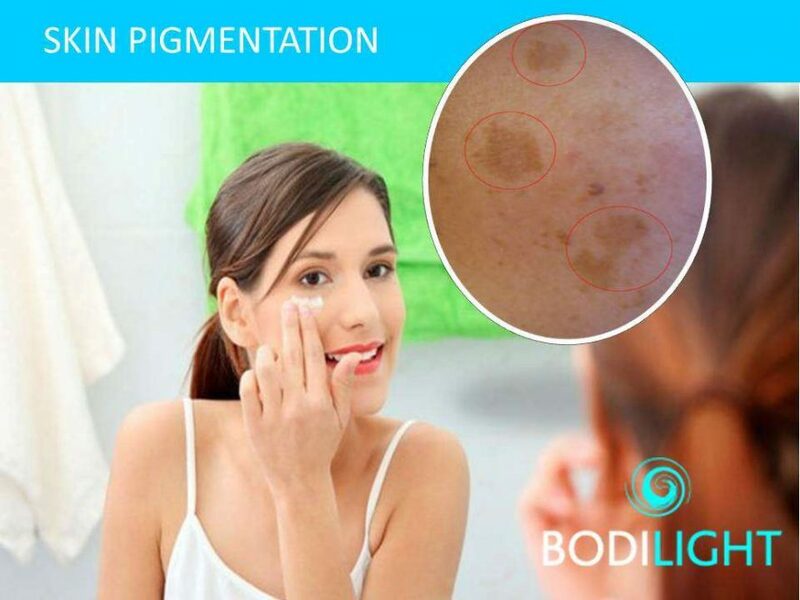 Bodilight offers all the treatments discussed above. When treating hyperpigmentation, it is important to understand a client’s health history and factors such as ethnicity to help determine the cause. This way the best course of action can be chosen. It is also important for the client to understand the disorder and skin care treatment proposed as well as be guided as far as expectations. This would all be discussed during your free consultation at the Bodilight clinic.